Submitted by IPSC on Sun, 01/11/2009 - 22:17. 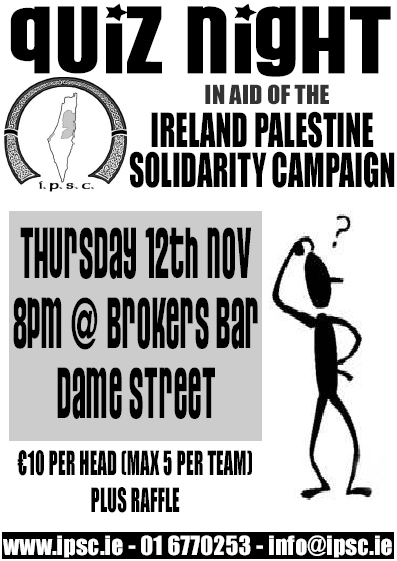 On Thursday 12th November 2009, as part of the international Week of Solidarity Against the Apartheid Walls in Palestine and Siege of Gaza we will be holding a fundraiser pub quiz in aid of the Ireland Palestine Solidarity Campaign. It will start at 8pm in Brokers Bar on Dame Street (near the Central Bank Plaza). Cost for entry is €10 per person, with teams of 4 to 5 people maximum. Please come along (and bring your friends!) and support the work of the IPSC in our struggle for justice for the Palestinian people. We depend on your support! Submitted by IPSC on Sun, 01/11/2009 - 22:16. 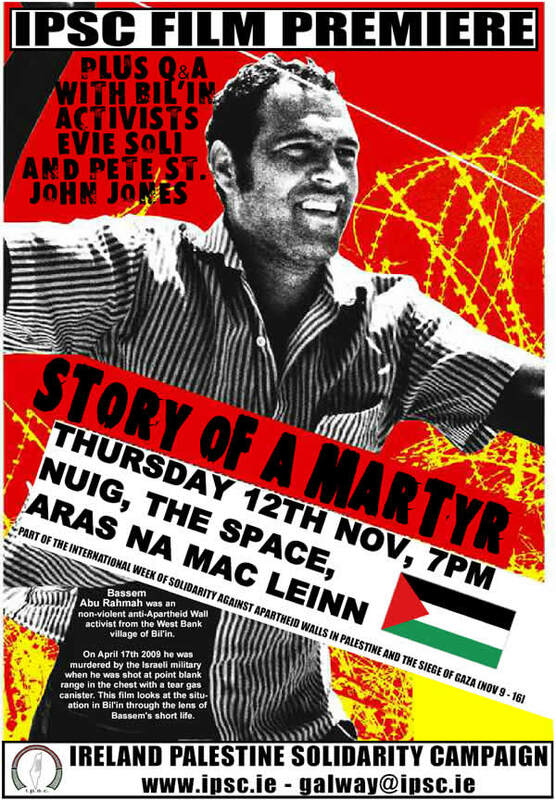 On Thursday 12th November 2009, as part of the international Week of Solidarity Against the Apartheid Walls in Palestine and Siege of Gaza the Ireland Palestine Solidarity Campaign is proud to present an Irish Premiere screening of the documentary "Bassem Abu Rahmah - Story of a Martyr". The screening of this short documentary will be followed by a question and answers session with Evie Soli and Pete St. John Jones, two international activists who have been a part of the non-violent resistance movement in the West Bank village of Bil'in. Submitted by IPSC on Sun, 01/11/2009 - 22:14. The Ireland Palestine Solidarity Campaign is proud to present an Irish Premiere screening of a new documentary about Israel's Winter Offensive in Gaza. 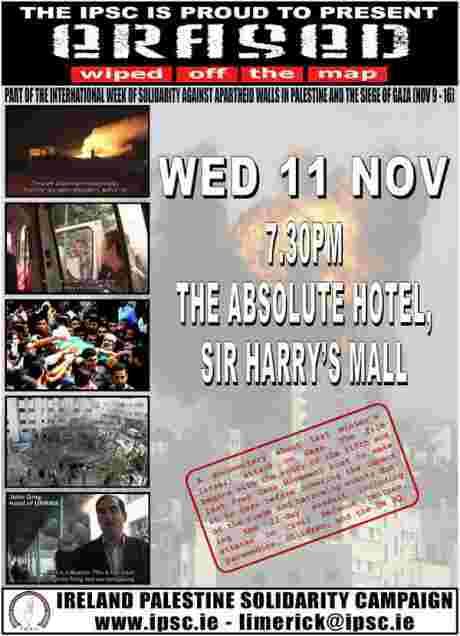 The screening will take place on Wednesday 11th November at 7.30pm in the Absolute Hotel, Sir Harry's Mall, Limerick. Submitted by IPSC on Sun, 01/11/2009 - 22:13. 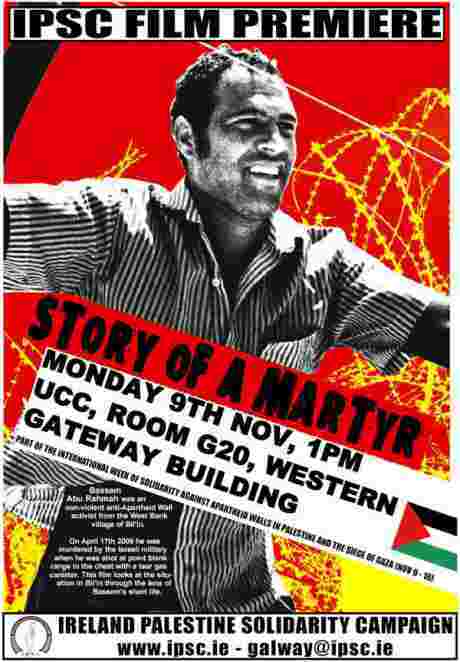 On Tuesday 10th November 2009, as part of the international Week of Solidarity Against the Apartheid Walls in Palestine and Siege of Gaza the Ireland Palestine Solidarity Campaign is proud to present an Irish Premiere screening of the documentary "Bassem Abu Rahmah - Story of a Martyr". 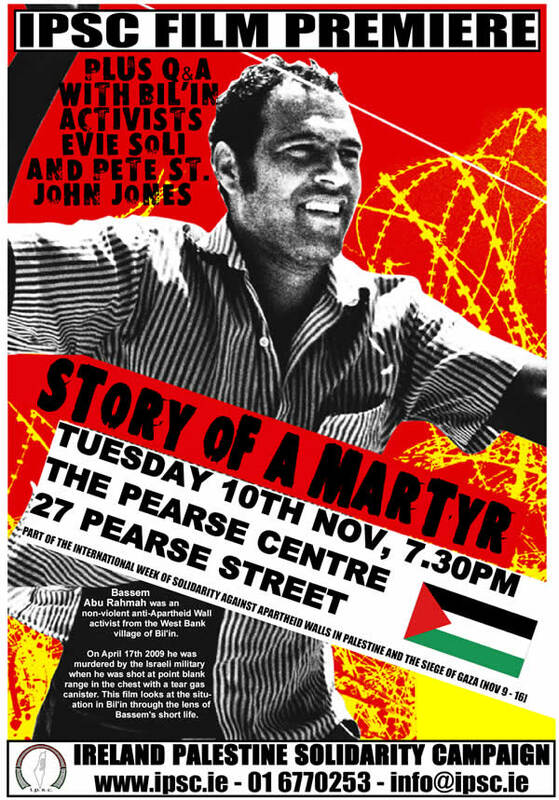 The screening of this short documentary will be followed by a question and answers session with Evie Soli and Pete St. John Jones, two international activists who have been a part of the non-violent resistance movement in the West Bank village of Bil'in. The film will start at 7.30pm in the Pearse Centre, 27 Pearse St, Dublin 2. Submitted by IPSC on Sun, 01/11/2009 - 22:12. On Monday 9th November 2009, as part of the international Week of Solidarity Against the Apartheid Walls in Palestine and Siege of Gaza the Ireland Palestine Solidarity Campaign is proud to present an Irish Premiere screening of the documentary "Bassem Abu Rahmah - Story of a Martyr". The film will start at 1pm in the Room G20, Western Gateway Building, UCC, Cork . Submitted by IPSC on Wed, 21/10/2009 - 23:06. 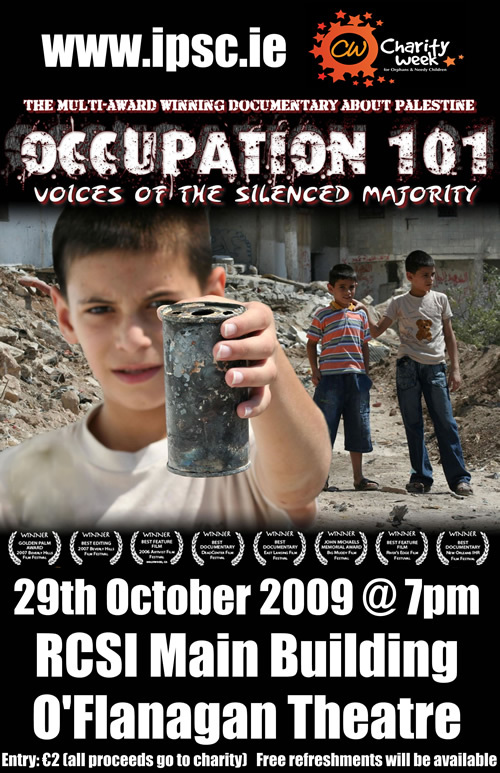 Occupation 101: Voices of the Silenced Majority is an award winning 2006 documentary on the Israeli-Palestinian conflict. The film focuses on the effects of the Israeli occupation of the West Bank and Gaza Strip, and discusses events from the rise of Zionism to the Second Intifada. Occupation 101 includes interviews with mostly American and Israeli scholars, religious leaders, humanitarian workers, and NGO representatives.